The semiconductor fab equipment market is heading for a big growth in 2014. SEMI, the industry Association for semiconductor equipment manufacturers has forecasted the capital expenditure for semiconductor fab equipment spending will increase to US$ 39.8 billion in 2014, the highest on record. Semiconductor companies after seeing a better revenue in 2013 compared to 2012, and also expecting good growth in 2014, they are planning to increase the capital expenditure. SEMI says its report tracks over 200 projects, with details revealing that fab equipment spending is expected to decline by 1 percent in 2013 (to $31.8 billion), but increase by 25 percent in 2014, including new, used and internally manufactured in-house equipment. Overall fab spending in the first half of 2013 was slow, especially for fab equipment spending. Fab equipment spending is stronger in the second half of 2013, with a 30 to 40 percent increase over the first half. The SEMI data shows a different outlook for fab construction projects, forecasting a 25 percent spending increase in 2013 to over $7 billion and then a drop of 16 percent in 2014 to about $5.9 billion. Fabs under construction this year will begin equipping next year which affects fab equipment spending. Fab equipment spending for dedicated foundries remains strong in 2013 ($12 billion) and in 2014 ($13 billion) — a growth rate of 5 percent in 2014. In the years prior to the economic downturn, fab equipment spending for DRAM was the highest spending industry segment. Since 2011, however, the dedicated foundry sector replaced DRAM as the leading industry sector. 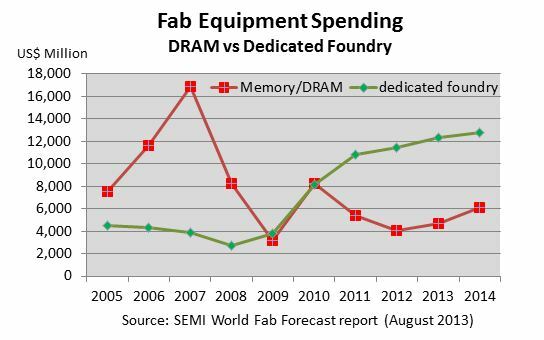 While DRAM equipment spending dropped by 35 percent in 2011 and 25 percent in 2012, the SEMI data shows that DRAM fab equipment spending will increase by 17 percent in 2013 and at least 30 percent in 2014. An increase of about 2 to 3 percent for installed capacity for DRAM in 2014 is small but remarkable, given that the industry has not added any new DRAM capacity for years, and actually cutback capacity between 2011 and 2013. The sector with largest growth rate for fab equipment spending in 2014 is expected to be Flash with a 40 to 45 percent increase (YoY). Over the last few years, capacity additions for the Flash sector also stagnated though technology investments. SEMI’s reports show detailed predictions for robust spending in DRAM and Flash by several large companies including Micron and Samsung. Overall fab equipment spending for Flash alone is expected to hit a record of almost $8 billion in 2014. After Flash and DRAM, MPU is expected to show the next largest growth in 2014, with fab equipment spending growing by over 40 percent (YoY). Intel is now preparing for 14nm, kicking off an MPU surge for 2014. The World Fab Forecast report gives insight into Intel’s preparations for 14nm.